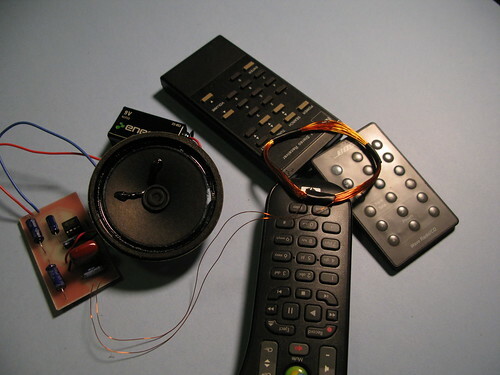 picking up noise from the guts of remote controls. Very cool, any chance to get a schematic and/or parts list? Wish I could make your hackerspace event. Got a schematic for the coil circuit? You can buy the coil amplifier kit at Electronic Goldmine. the kit looks nice but for us diy people building and soldering urself is nice so do you have a keyword or something if i should search for a free schematic on the www. is it understood correctly if i see it as a normal amplifier with an inducttion coil connected as input? Yes! Put a coil at the input of a high-impedance amplifier. You can also try searching for “telephone amplifier” schematics – the idea is that people who are hard-of-hearing can put the coil on their telephone receiver to amplify it. Just wanna say, really nice idea! There are alot, ALOT of diff electromagnetic sources to record/discover allaround us.